Ald. 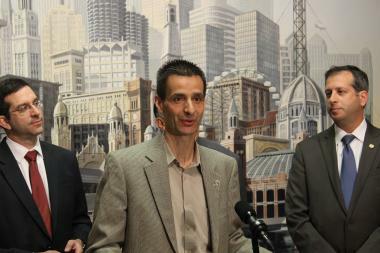 Nick Sposato (center) is stepping down from the Progressive Caucus he helped form. CITY HALL — Ald. Nicholas Sposato (38th) — one of the founders of the City Council's Progressive Caucus — resigned from the group Thursday, citing his health and a growing unease with several immigrant rights measures championed by the group. Sposato, who has multiple sclerosis and uses a wheelchair, said he could no longer handle the extra work that came with being a member of the caucus, which meets frequently. "There's no hard feelings," Sposato said. "But it was time to move on." Sposato was the only member of the caucus — which often opposes measures supported by Mayor Rahm Emanuel — to vote Wednesday against the creation of a $1.3 million fund that will be used to defend immigrants threatened with deportation under President-elect Donald Trump. Sposato and Ald. Joe Moreno (1st), whose grandfather fought in World War II as an undocumented immigrant, clashed bitterly during the debate. Moreno is not a member of the progressive caucus. Sposato said he was increasingly uneasy with the caucus's support of Emanuel's insistence that Chicago will remain a sanctuary city despite Trump's promise to withhold federal funds from municipalities that protect undocumented immigrants from deportation. "When we started it, the original mission was to focus on labor issues," said Sposato, who wore a button to City Hall Monday that urged people to wish him Merry Christmas — not Happy Holidays. "It has moved away from that to more social issues." In the November election, 35 percent of 38th Ward voters picked Trump — the second-highest in the city, records show. Many residents of 38th Ward work for the city. In June, Sposato helped organize a "Police Lives Matter" rally designed to demonstrate Far Northwest Side residents' support for officers as anger over police-involved shootings inspired nationwide protests. Ald. Scott Waguespack (32nd), the caucus chairman, said the group would continue to push a progressive policy agenda. "We appreciate all the hard work Ald. Sposato has put in over the years, and we know he'll still be alongside us on a range of issues in standing up for Chicago's working people," Waguespack said in a news release. Sposato, a former firefighter, is in his second term on the Council. In 2011, Sposto was elected to represent the 36th Ward, which saw its boundaries redrawn to include a majority of Latino residents. In 2015 election, Sposato ran to represent the 38th Ward, defeating six candidates. The progressive caucus grew after the 2015 election even though Emanuel targeted several of its members for defeat — but did not fund any of Sposato's opponents. Sposato said his decision to leave the caucus would have no impact on how he votes on the Council. "I'll still be with them on labor issues," Sposato said, adding that it was a difficult decision to leave a group he helped form. "They are all still my best friends." Sposato said the combination of his declining health, the winter weather and his growing unease with some of the initiatives of the caucus spurred him to act after months of consideration. "I want to focus on my ward," Sposato said.